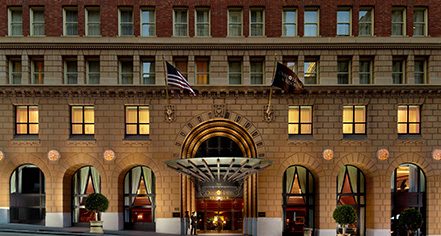 The Omni San Francisco Hotel provides luxury accommodations in the heart of downtown San Francisco. This beautiful Financial District hotel is located right on the cable car line and is only a short walk to Union Square, Chinatown, North Beach, and many of the city's famous sights. Ideal for a romantic getaway, the Omni San Francisco Hotel offers modern amenities in a boutique ambiance due to its quintessential San Francisco architecture and modern day financier style. Built as a bank in 1926, the lobby is adorned with Italian marble, rich fabrics, and Austrian crystal chandeliers. Its classic elegance makes the hotel the perfect location for a memorable wedding reception. The newly refreshed Bob's Steak & Chop House has carved out a reputation as one of America’s great steak houses. From great food to attentive and seasoned wait staff, Bob’s Steak & Chop House offers an unmatched dining experience in the heart of San Francisco. The hotel is located just 30 minutes from San Francisco International Airport. 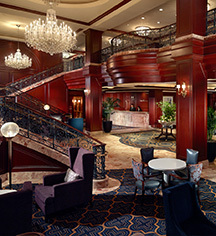 Omni San Francisco Hotel, a member of Historic Hotels of America since 2010, dates back to 1926.